Yet the Islamic State is hardly the first extremist movement to combine violent tendencies, grandiose ambitions, and territorial control. Its religious dimension notwithstanding, the group is just the latest in a long line of state-building revolutionaries, strikingly similar in many ways to the regimes that emerged during the French, Russian, Chinese, Cuban, Cambodian, and Iranian revolutions. These movements were as hostile to prevailing international norms as the Islamic State is, and they also used ruthless violence to eliminate or intimidate rivals and demonstrate their power to a wider world. The earlier episodes are reassuring when contemplating the Islamic State today. They show that revolutions pose serious dangers only when they involve great powers, since only great powers have proved capable of spreading their revolutionary principles. The Islamic State will never come close to being a great power, and although it has attracted some sympathizers abroad, just as earlier revolutions did, its ideology is too parochial and its power too limited to spark similar takeovers outside Iraq and Syria. History also teaches that outside efforts to topple a revolutionary state often backfire, by strengthening hard-liners and providing additional opportunities for expansion. Today, U.S. efforts to “degrade and ultimately destroy” the Islamic State, as the Obama administration has characterized U.S. policy, could enhance its prestige, reinforce its narrative of Western hostility to Islam, and bolster its claim to be Islam’s staunchest defender. A better response would rely on local actors to patiently contain the group, with the United States staying far in the background. This approach requires seeing the Islamic State for what it is: a small and underresourced revolutionary movement too weak to pose a significant security threat, except to the unfortunate people under its control. Revolutions replace an existing state with a new one based on different political principles. These upheavals are usually led by a vanguard party or rebel group, such as the Bolsheviks in Russia, the Communist Party in China, the Khmer Rouge in Cambodia, or Ayatollah Ruhollah Khomeini and his followers in Iran. Sometimes, a revolutionary movement overthrows the regime on its own; other times, it exploits a power vacuum after the old order has collapsed for other reasons. Because revolutions are violent struggles conducted in the face of enormous obstacles, their leaders need abundant luck to topple a regime and consolidate control afterward. They must also convince their supporters to run grave risks and overcome the natural inclination to let others fight and die for the cause. Revolutionary movements typically use a combination of inducement, intimidation, and indoctrination to enforce obedience and encourage sacrifices, just as the Islamic State is doing now. In particular, they purvey ideologies designed to justify extreme methods and convince their followers that their sacrifices will bear fruit. The specific content of these beliefs varies, but their purpose is always to persuade supporters that replacing the existing order is essential and that their efforts are destined to succeed. Typically, revolutionary ideologies do this in three main ways. The Islamic State is no different. Its leaders and ideologues portray the West as innately hostile and existing Arab and Muslim governments as heretical entities contrary to Islam’s true nature. Compromise with such infidels and apostates makes no sense; they must be eliminated and replaced by leaders following what the Islamic State regards as true Islamic principles. Third, leaders of revolutionary movements usually see their model as universally applicable. Once victorious, they promise their followers, the revolution will liberate millions, create a more perfect world, or fulfill some divinely ordained plan. French radicals in the 1790s called for a “crusade for universal liberty,” and Marxist-Leninists believed that world revolution would produce a classless, stateless commonwealth of peace. Similarly, Khomeini and his followers saw the revolution in Iran as the first step toward the abolition of the “un-Islamic” nation-state system and the establishment of a global Islamic community. In the same way, the Islamic State’s leaders believe that their fundamentalist message applies to the entire Muslim world and beyond. In July 2014, for example, Baghdadi declared that the Islamic State would one day unite “the Caucasian, Indian, Chinese, Shami [Syrian], Iraqi, Yemeni, Egyptian, Maghribi [North African], American, French, German, and Australian.” The Islamic State uses social media to spread its message abroad and is quick to claim credit for faraway violent acts. This claim to universal applicability forms a key part of the group’s appeal to foreigners and is one reason other governments view the group with such alarm. Outsiders rightly worry that a revolutionary state might try to expand. Revolutionary leaders usually believe that it is their duty to export their movement and that doing so is also the best way to keep it alive—an idea captured in the Islamic State’s slogan “lasting and expanding” (baqiya wa tatamaddad). Not surprisingly, then, the neighbors of revolutionary states typically consider preventive measures to weaken or overthrow the new regime. The result is a spiral of suspicion and an increased danger of war. Conflicts between revolutionary regimes and other states are exacerbated further by a paradoxical combination of insecurity and overconfidence on both sides. New revolutionary leaders know that their position is tenuous and that opponents may seek to crush them before they can consolidate power. At the same time, their unlikely success, along with their optimistic worldview, leads them to believe that they can beat the odds and overcome far more powerful opponents. Among nearby states, the same problem often occurs in reverse: they are usually alarmed by the new state’s extreme goals yet confident they can get rid of it before it consolidates power. Part of the problem is that revolutions create great uncertainty, which in turn fosters miscalculation. For one thing, outsiders often have little direct contact with the new regime, so they cannot gauge its true intentions and level of resolve or clearly communicate their own redlines. Few outsiders have met with the Islamic State’s top leaders, for example, so it remains mysterious what they really believe and how resolute they will prove to be. Judging a revolutionary state’s fighting capacity can also be difficult, especially if it rests on radically different social foundations. Austria and Prussia thought the revolution in France had left it vulnerable to military defeat; instead, nationalist fervor and the mass conscription of able-bodied men—the infamous levée en masse—soon made France the strongest power in Europe. In Iraq, Saddam Hussein mistakenly believed that the fall of the shah had left Iran open to attack, but when his forces invaded the country in 1980, the clerical regime mobilized new sources of military power, such as the Revolutionary Guard, and turned the tide of battle in Iran’s favor. It is also impossible to know for certain whether a revolution will be contagious, but there is usually some reason to fear it might be. Revolutionary states’ ambitions inevitably strike sympathetic chords abroad and convince some number of foreign sympathizers to flock to their banner. Antimonarchical elements from all over Europe swarmed to Paris in the 1790s, and Westerners such as the Harvard-educated social activist John Reed journeyed to Russia following the Bolshevik Revolution. Such reverberations reinforce fears of contagion: Europeans from London to Moscow worried that the revolution in France might topple thrones across Europe, just as Europeans and Americans obsessed about the spread of Bolshevism after 1917 and otherwise sensible people succumbed to McCarthyism in the 1950s. To make matters even more confusing, revolutions also generate a flood of refugees fleeing the new regime. Eager to persuade foreign powers to help them return home, exiles typically offer lurid accounts of the new state’s crimes (which may well be true) while suggesting the new regime can be easily defeated. French, Russian, Chinese, Cuban, Iranian, and Nicaraguan exiles made such claims to convince foreign powers to intervene in their home countries, but governments who took their advice usually came to regret it. Ironically, the uncertainties that accompany most revolutions can sometimes help the new state survive. Because foreign powers cannot know for sure how powerful or appealing the revolution will be, they cannot easily determine which is the greater threat: the revolution itself or the possibility that other rivals will take advantage of the resulting chaos to improve their own positions. The revolution in France survived in part because its monarchical foes were suspicious of one another and initially more interested in making territorial gains than in restoring Louis XVI to the throne. Similarly, divisions among the major powers and uncertainty about the Bolsheviks’ long-term intentions impeded a coordinated response to the revolution in Russia and helped Lenin and his followers retain power after 1917. Yet contrary to revolutionaries’ hopes and their adversaries’ fears, the aftermath of most revolutions is neither a rapidly spreading revolutionary cascade nor a swift counterrevolutionary coup. The more typical result is a protracted struggle between the new regime and its various antagonists, which ends when the revolutionary government is removed from power, as the Sandinistas were in Nicaragua, or when the state moderates its revolutionary aims, as the Soviet Union, communist China, and revolutionary Iran eventually chose to do. These complex dynamics are all evident with the Islamic State today. Its leaders regard the outside world as hostile and heretical, believe their opponents are doomed to collapse, and see their successes as the beginning of an irresistible transnational uprising that will sweep away existing states. The group has proved surprisingly capable at providing security and basic services in its territory, spreading its message online, and fighting on the ground against weak opponents. Its ability to attract thousands of foreign fighters, meanwhile, has raised concerns about the group’s broader appeal and its potential to inspire violent attacks in other countries. Testimony from refugees fleeing the Islamic State’s territory has amplified these fears and reinforced opponents’ urge to destroy the new state before it grows stronger. At the same time, just as with past revolutionary movements, efforts to defeat the Islamic State have been undermined by opponents’ conflicting priorities. Both the United States and Iran want to see the end of the Islamic State, but neither country wants to help the other gain influence in Iraq. Turkey also views the group as a threat, but it loathes the Assad regime in Syria and opposes any actions that might strengthen Kurdish nationalism. Saudi Arabia, for its part, sees the Islamic State’s fundamentalist ideology as a challenge to its own legitimacy, but it fears Iranian and Shiite influence as much, if not more. As a result, none of these countries has made defeating the Islamic State its top priority. Its penchant for violence and use of sexual slavery notwithstanding, there is little that is novel about the Islamic State. Its basic character and impact are strikingly similar to those of earlier revolutionary states. We have seen this movie many times before. But how does it end? Still, might the Islamic State overwhelm weaker neighbors, such as Jordan, Iraqi Kurdistan, the rest of Syria, or even parts of Saudi Arabia? This is highly unlikely, for the Islamic State has faced growing resistance whenever it has tried to move outside the ungoverned Sunni areas in which it arose. And were the Islamic State to expand significantly, the result would be more vigorous and coordinated resistance from its more powerful neighbors. The Islamic State has already triggered stepped-up efforts to contain it, most notably Turkey’s recent decision to seal its southern border, create a buffer zone in northern Syria, and allow U.S. aircraft to use the Incirlik Air Base for bombing missions in Iraq and Syria. One can say with confidence that the group will never conquer a substantial portion of the Middle East, let alone any areas beyond it. Nor will the Islamic State spread via contagion. Overturning even a weak government is difficult, and revolutionary movements succeed only on rare occasions. It took two world wars to bring the Marxists to power in Russia and China, and the Islamic State succeeded only because the stars aligned: the United States foolishly invaded Iraq, Iraqi Prime Minister Nouri al-Maliki governed in a particularly divisive manner, and Syria fell into civil war. Absent equally fortuitous events, the Islamic State will have a tough time replicating its rise elsewhere. Spreading a revolution via contagion also requires a level of resources that only great powers possess. The Soviet Union was powerful enough to subsidize the Communist International and support client states around the world, but medium-sized revolutionary powers are not so fortunate. Iran has backed a number of proxies over the past 30-plus years, but it has yet to create a single successful clone. The Islamic State is far weaker than Iran, and any foreign subsidiaries it inspires will have to rely on their own resources to succeed. Moreover, a successful revolution serves as a wake-up call for nearby states, prompting them to take steps to prevent a repeat performance on home soil. European powers contained the threat of Bolshevism domestically after 1917 by suppressing suspected revolutionaries and addressing the concerns of the working class, and the United States helped do the same thing in Europe and Asia after World War II by establishing the Marshall Plan and providing security through nato and its alliances in Asia. Iran, the Gulf monarchies, and other Muslim governments are already working to contain the Islamic State’s influence by restricting its intake of foreign fighters, interrupting its financing, and encouraging local religious authorities to challenge its religious claims. Muslim communities in Europe and elsewhere are busy countering its poisonous message, as well. Despite these efforts, some individuals will still succumb to the Islamic State’s allure, but even 100,000 foreign recruits would not be enough to shift the balance of power in its favor. Only a tiny fraction of the world’s billion-plus Muslims are interested in submitting to the group’s brutal discipline, and many who rush to join it today will become disillusioned and eager to leave or end up isolated in a landlocked country and unable to cause trouble elsewhere. To be sure, some foreign fighters have already returned home and carried out terrorist acts, and foreigners inspired by the Islamic State’s propaganda have staged “lone wolf” attacks in several countries. Such incidents will not disappear, but they will be too few and too small in scope to topple a government. According to The New York Times, since September 2014, groups or individuals claiming some connection to the Islamic State have killed roughly 600 people outside Iraq and Syria—a total dwarfed by the 14,000-plus people murdered in the United States in that same period. All these deaths are regrettable, but violence on a comparatively modest scale will not expand the Islamic State’s sway. The Islamic State’s ideology will also limit its ability to grow. Although the group’s leaders believe that their vision of a new caliphate is irresistible, it is unlikely to capture enough hearts and minds. The ideals of liberty and equality embodied in the American and French Revolutions resonated around the world, and communism’s vision of a classless utopia appealed to millions of impoverished workers and peasants. By contrast, the Islamic State’s puritanical message and violent methods do not travel well, and its blueprint for an ever-expanding caliphate clashes with powerful national, sectarian, and tribal identities throughout the Middle East. Using Twitter, YouTube, or Instagram won’t make its core message more palatable to most Muslims, especially after the novelty wears off and potential recruits learn what life in the Islamic State is really like. In any case, a version of Islam that is anathema to the vast majority of Muslims will certainly not gain a following among non-Muslims. If one were trying to invent a revolutionary credo devoid of universal appeal, it would be hard to beat the Islamic State’s harsh and narrow worldview. 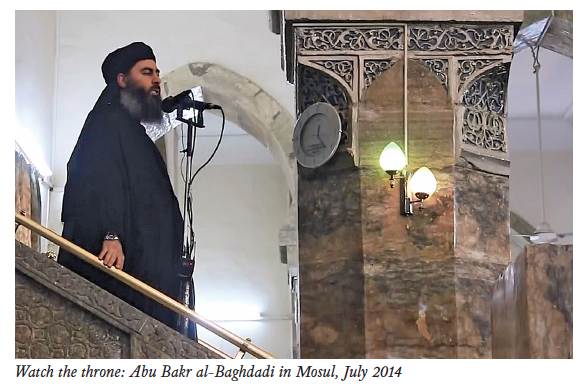 Finally, should an Islamic State–like movement manage to gain power outside Iraq and Syria—as could conceivably occur in the chaos of Libya—that group’s leaders would follow their own interests rather than slavishly obey Baghdadi’s commands. Outsiders often see radical groups as monolithic—especially if they take the revolutionaries’ own rhetoric too seriously—but such movements are notoriously prone to infighting. Deep schisms divided Girondins and Jacobins, Bolsheviks and Mensheviks, Stalinists and Trotskyites, and Khrushchev and Mao. The Islamic State’s tendency to treat minor disagreements as acts of heresy punishable by death makes such disputes inevitable. Indeed, it has already led to serious quarrels with al Qaeda and other extremist groups. Critics might find this assessment too sanguine. They might contend that neighboring states are more fragile than commonly thought and that the Islamic State’s example might shake the foundations of the House of Saud, Jordan’s Hashemite Kingdom, or Egypt’s military dictatorship. Given the fragility of the Middle Eastern order and the widespread discontent that sparked the Arab Spring, could the Islamic State be an exception to the rule that revolutions rarely spread? Perhaps, but this worst-case scenario is highly unlikely. If it were easy for radicals to topple foreign governments, it would happen far more often. Existing governments do not have to be especially capable to ward off revolutions, and the Islamic State’s potential targets have money, organized security forces, support from influential religious authorities, and sympathetic foreign backers. For all these reasons, the Islamic State’s emergence does not herald the beginning of a revolutionary tidal wave. Just because the Islamic State’s long-term goal is doomed to fail, however, doesn’t mean that eliminating the group will be easy. In fact, history suggests that trying to destroy it with military force could easily backfire. Foreign intervention by Austria and Prussia radicalized the French Revolution, and Iraq’s invasion of Iran in 1980 allowed Khomeini and his followers to purge moderate elements in the Islamic Republic. Lenin, Stalin, and Mao used foreign threats to mobilize support and consolidate power, and both the Russian and the Chinese Revolutions survived several attempts to undo them. Likewise, aggressive efforts to destroy the Islamic State could help it survive, especially if the United States takes the leading role. That leaves patient containment as the best policy. Over time, the movement may collapse from its own excesses and internal divisions. That outcome would be preferable, of course, but it is not guaranteed. Fortunately, history suggests that if the Islamic State survives, it will become a more normal state over time. Revolutionaries can fantasize about transforming the world while out of power, but to survive over the long term, they must learn to compromise their ideals and moderate their behavior, even if they do not wholly abandon their original principles. Leon Trotsky’s dreams of “world revolution” gave way to Stalin’s “socialism in one country,” and Mao’s radical policies at home were accompanied by a risk-averse policy toward other states. Revolutionary Iran has followed a similar trajectory and conducted its foreign policy in a mostly prudent and calculating manner. Eventually, the rest of the world, even the United States, came to terms with these revolutionary states. Normalization does not occur automatically, of course, and revolutionary states do not tame their behavior unless other states teach them that relentless extremism is costly and counterproductive. This means the Islamic State must be contained for the foreseeable future, until it moderates its revolutionary aims or even abandons them entirely. Containment worked against the Soviet Union, and a similar approach has limited Iran’s influence for more than three decades. To succeed, a policy of containment must prevent the Islamic State from conquering other countries and imposing its radical vision on them. Because the Islamic State is weak and its core message is so corrosive, preventing further expansion should not be beyond the capacity of the frontline countries with the most at stake, with only modest help from the United States. The Kurds, Iraq’s Shiites, Iran, Turkey, Jordan, the Gulf monarchies, and Israel are not going to stand by and watch the Islamic State grow, and any minor victories it does obtain will encourage its neighbors to balance against it more vigorously. Washington should provide intelligence, weapons, and military training to aid such efforts, but it should keep its role as small as possible and make it crystal clear that stopping the Islamic State is largely up to local forces. It follows that U.S. airpower should be used solely to prevent the Islamic State from expanding; trying to bomb it into submission will inevitably kill innocent civilians, strengthen anti- American sentiment, and bolster the Islamic State’s popularity. Regional actors will no doubt try to pass the buck and get Americans to do their fighting for them. U.S. leaders should reject such ploys politely but firmly and pass the buck right back. The Islamic State is not an existential threat to the United States, to Middle Eastern energy supplies, to Israel, or to any other vital U.S. interest, so U.S. military forces have no business being sent into harm’s way to fight it. Successfully containing the Islamic State also requires Middle Eastern countries to do more to insulate themselves against its revolutionary message. Governments can reduce the risk of contagion by undertaking energetic counterterrorist efforts—tracking and arresting potential sympathizers, drying up financial support, and so on—and by tackling the corruption that makes the Islamic State look like an attractive alternative. Respected Muslim authorities in neighboring countries should remind their coreligionists that Islamic civilization was at its height not when it was most dogmatic or intolerant but when it was most inclusive. To undercut the Islamic State’s local support, Washington should continue to press the Shiite-dominated government in Baghdad to adopt more inclusive policies toward Sunnis. The United States should encourage these efforts in private and support them in public, while resisting its normal tendency to tell local governments how to run their own countries. Recent U.S. efforts to steer local politics in the Middle East have been a series of embarrassing failures, and U.S. leaders should be modest in offering advice today. Washington can also encourage its European allies to better integrate their own Muslim minorities, but that task is ultimately up to them, too. Indeed, U.S. policymakers should keep in mind that the more involved the United States gets in containing the Islamic State, the more it will reinforce the Islamic State’s propaganda about Western crusaders and their supposedly heretical Muslim allies. At the sectarian level, were the United States to undertake another costly effort to rebuild Iraq’s security forces, it would appear complicit in the anti-Sunni policies that helped make the Islamic State popular, thus encouraging Sunnis in Iraq and eastern Syria to remain loyal to the group. A U.S.-led campaign against the Islamic State also risks heightening its appeal: if the world’s mightiest country keeps insisting that the group is a grave threat, then its claim to be the most faithful defender of Islam will gain credence. Instead of hyping the threat and reinforcing the Islamic State’s own propaganda, it would be far better for U.S. policymakers to treat the group as a minor problem that deserves only modest attention. Taking the lead against the Islamic State would also encourage free-riding by local powers with far more at stake. The best defense against Islamic extremism is improved governance throughout the Middle East, but that difficult process will not even begin if local governments believe Washington will protect them no matter what. The more the United States does, the less incentive local actors will have to get their own houses in order. In short, containing the Islamic State is more likely to succeed if the United States declines to do the heavy lifting. This hands-off approach requires American leaders to remain cool in the face of beheadings, terrorist attacks, the destruction of antiquities, and other provocations. Such discipline is not easy to maintain in the era of partisan politics and 24-hour cable news, and it runs counter to the interventionist instincts of much of the U.S. foreign policy establishment. But not every foreign tragedy is a threat to U.S. interests, and not every problem needs to be solved by American power. The United States blundered badly when it responded to 9/11 by invading Iraq—precisely the sort of error Osama bin Laden had hoped it would make—and the Islamic State would no doubt welcome another misguided U.S. intervention in the Middle East. It would be worse than a crime to make the same mistake again.